Three posts in as few days; we must be getting to the end of the summer holidays. It seems that everyone is slowly trickling back home again, after various vacations, and everyone seems so much more relaxed and open-minded. Obviously long vacations are very much needed by us all. 2. Next, I have been reading one incredibly fabulous classical music blog. I've mentioned this one before here, but I'm truly reading it like a novel. FABULOUS, and hats off to Jeremy Denk's amazingly deep yet squirmish music blog. I just LOVE it. The above links back to the old blog (start there for sure) and then eventually you can catch up with the new blog here. 3. And finally; I have discovered through searching for good classical music blogs, that Deutsche Gramaphone is streaming live videos of summer concerts online until September. This Martha Argerich Prokofiev Concerto no. 3 is stupendous. After much applause the orchestra then plays Tchaikovsky's Symphony No. 5. Well worth a huge listen on a rainy afternoon in August. 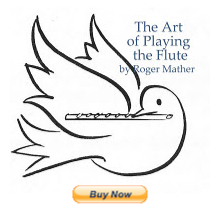 (Getting a chance to play in an orchestra such as this is a great goal for young flute students also.) And,not only is Argerich my absolute favourite in terms of intensity and Authority/Authenticity, but the viewpoint that the camera is filming from is indeed the viewpoint of the flute section. Interesting to be "sitting just exactly right there" and hearing my favourite performer play one of my favourite works. So glad your going to publish some of your trios. Having heard some I know they are certainly excellent. When you perform them with your trio you should share some recordings of them with us all and the different flute groups. Then we will know which ones we might purchase.